"Beau Bear: The Fible of the Hidden Blue Treasure" is the second eBook in the Fibles Adventure Series. A Fible (pronounced (fib-el) is a story with an untruth. This adventure story is about a little bear who takes a journey to Blue Island. His cousin, who lives on the island, fears mysterious things are happening. Young children and adults alike will enjoy the kind and good-natured Beau Bear as he figures out the mystery of Blue Island. 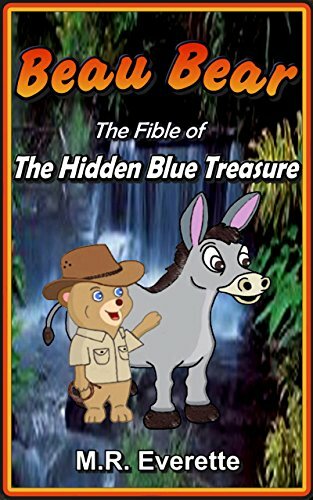 Beau Bear, along with his best friend and traveling companion Wheelburro, learn about the folklore of Blue Island and how it got the name from the old pirate Captain Blue Fox. The island is said to hold the hidden Blue treasure. While the mystery unfolds, Beau Bear and Wheelburro become separated on the island. Friendships get tested in their quest to seek a truth about Blue Island and the hidden Blue treasure. Will Beau Bear be able to solve the mystery of Blue Island? "Beau Bear: The Fible of the Hidden Blue Treasure" adventure story imparts the values of friendship, caring, and the acceptance of others whom they are not familiar with. This wonderful eBook comes with 15 colorful illustrations that visually help narrate the story. Young children and adults alike will be entertained by Wheelburro and the eBook's cast of characters. Recommended for children ages 4-6.